We love this new box.....!!! 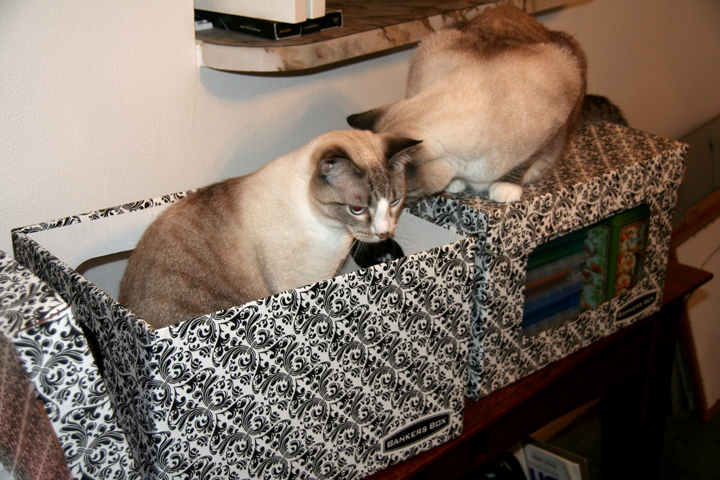 WOW that does look like a very nice box HH brought in JUST FOR you 2 handsome fellows. What a big box you have!!! Yes indeed, that is fancy and comfy looking boys! Nothing like a box and a kitty...well, maybe a bag and a kitty, same thing, a match made in heaven. Now that is a great box - it's beautiful and big enough to sit in - and it looks like there is a window in it too. WOW!! I must be part cat, I like boxes too! Those look like designer boxes! Pawsome boys! Wow, those are some fancy boxes! Have fun with them!! Looks like we're having so much fun with those pretty boxes! :D Hugs to both of you. Ah! Stylish AND efficient! Great choice of box my friends.